Sidney Brown thought the mole on his nose was just an annoying pimple. He didn't consider that it could be a cancerous tumor, because, Brown thought, "skin cancer is something white people get." On average, one person dies of melanoma, the deadliest form of skin cancer, every hour. Because this disease can affect anyone, everyone should take steps to reduce their risk and catch melanoma in its earliest stages, when it's most treatable. Researchers have developed a new non-invasive technique which can accurately detect malignant melanoma without a biopsy. Melanoma, newly diagnosed in more than 76,000 Americans in 2011, is the most common and dangerous form of skin cancer. Melanoma is rare in children, accounting for 1 to 4 percent of all melanoma cases and just 3 percent of pediatric cancers. Just as adult cases of melanoma are increasing, pediatric melanoma is rising at the rate of 1 to 4 percent per year. Melanoma -- the most serious form of skin cancer -- is becoming increasingly common, according to the May issue of Mayo Clinic Women's HealthSource. According to estimates from the American Cancer Society, melanoma, the most serious form of skin cancer, was responsible for an estimated 8,650 deaths in the United States in 2009. Of growing concern among dermatologists is the fact that melanoma is now the most common form of cancer for young adults 25-29 years old and the second most common cancer in adolescents and young adults 15-29 years old. In a new study published in Disease Models & Mechanisms, scientists use the zebrafish to gain insight into the influence of known cancer genes on the development and progression of melanoma, an aggressive form of human skin cancer with limited treatment options. Older men whose melanoma is detected by a physician are more likely to have thinner and therefore more treatable tumors at diagnosis, according to results of a survey published in the April issue of Archives of Dermatology. Melanomas appear as ugly ducklings! A preliminary study suggests that melanomas have a different appearance than other irregular skin moles (i.e., are “ugly ducklings”), according to a report in the January issue of Archives of Dermatology, one of the JAMA/Archives journals. 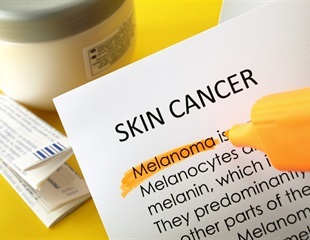 According to researchers in the U.S. recurrent melanoma is more common than previously thought, and as many as 15 percent of people diagnosed with the potentially fatal skin cancer are at risk of a second diagnosis within two years. Up to two-thirds of all cancers may be prevented through dietary and lifestyle changes. In the case of skin cancer, this could not be more true. In 2005, there will be an estimated 62,000 new cases of invasive melanoma and an estimated 7,600 deaths due to melanoma in the United States, according to background information in the article. Melanoma is the fifth leading cancer in men and the sixth leading cancer in women in the United States.